Need a quick dinner? 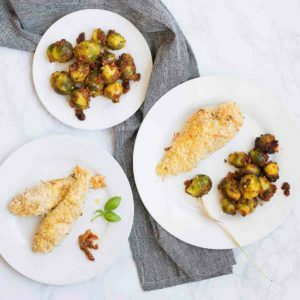 Try this Cheesy Crunch Chicken & Italian Brussel Sprouts Bake! This is a super simple meal that is cooked in a single pan. Can I get a hallelujah?! Be the star of family dinner when you present your family with this delicious dish. 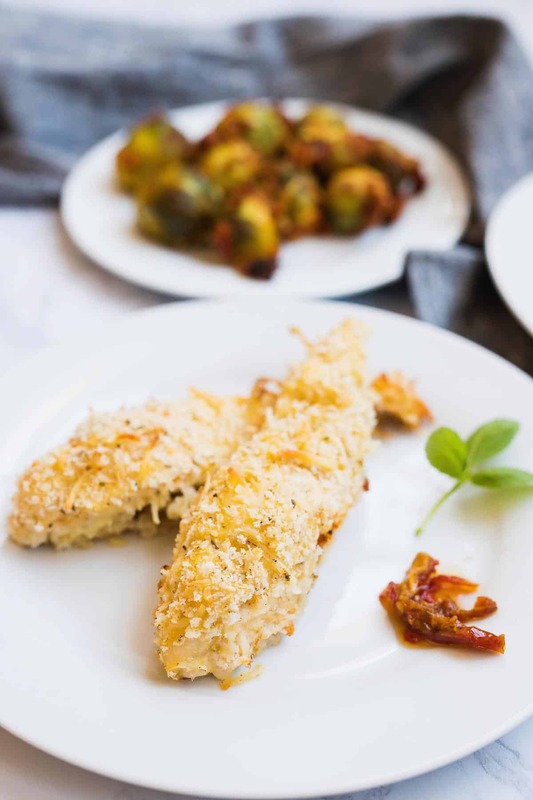 The Cheesy Crunch Chicken is a staple in our house and is something that my kids will always eat. They are basically a fancy (and way more delicious) version of chicken nuggets. 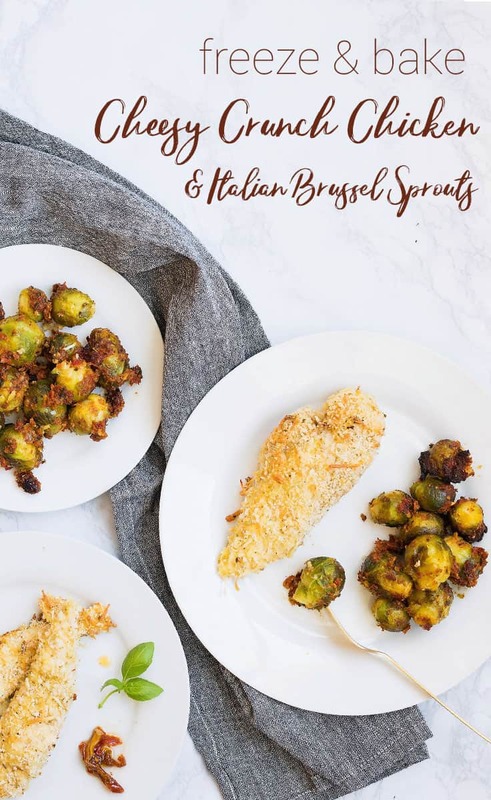 Plus, the Brussel Spouts are baked in drool worthy sun dried tomatoes and other delicious seasonings that make it a crowd-pleaser as well. My recommendation? Triple the recipe and freeze so you can bake this up for dinner at any time. Trim fat from chicken filets and coat a large rectangle foil pan with butter. In a medium bowl, combine cheese shreds, panko crumbs, garlic powder, salt, black pepper, and oregano. In a small bowl, whisk the egg with 1 tsp. (5 mL) minced garlic until frothy. Sprinkle the tops of each chicken filet with a little flour, making sure it is evenly coated. Next, dip each filet top in the egg mixture. Then, dip the tops in the panko cheese blend and place, tops up, in the center of the foil pan. In a food processor or blender; puree olive oil, sundried tomatoes, garlic, basil, salt, and lemon juice until almost smooth, about 2 minutes. It is okay to have a few nice pieces of tomato in the mix when done blending. 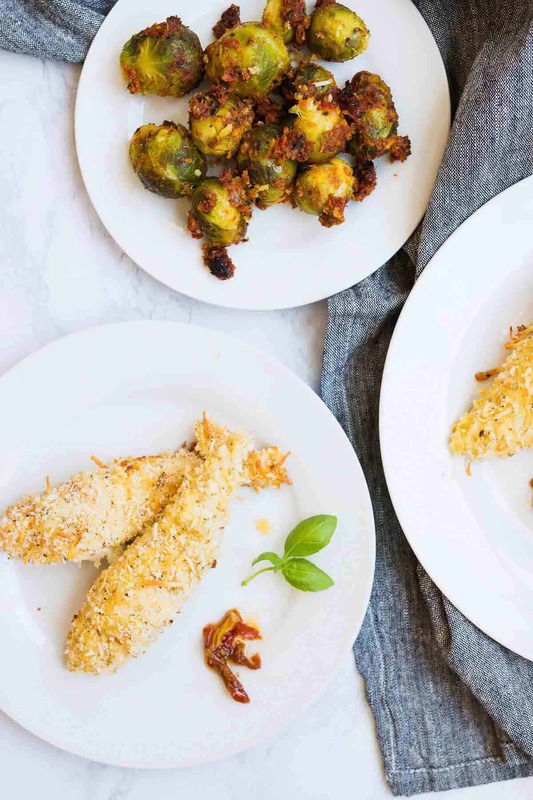 In a medium bowl, toss frozen Brussel sprouts together with the sundried tomato and lemon puree. Pour equal amounts on either side on the chicken filets in the foil pan. Preheat oven to 350°F (180°C) and bake filets and sprouts, uncovered for 40 minutes, or until chicken is cooked through. Serve hot. 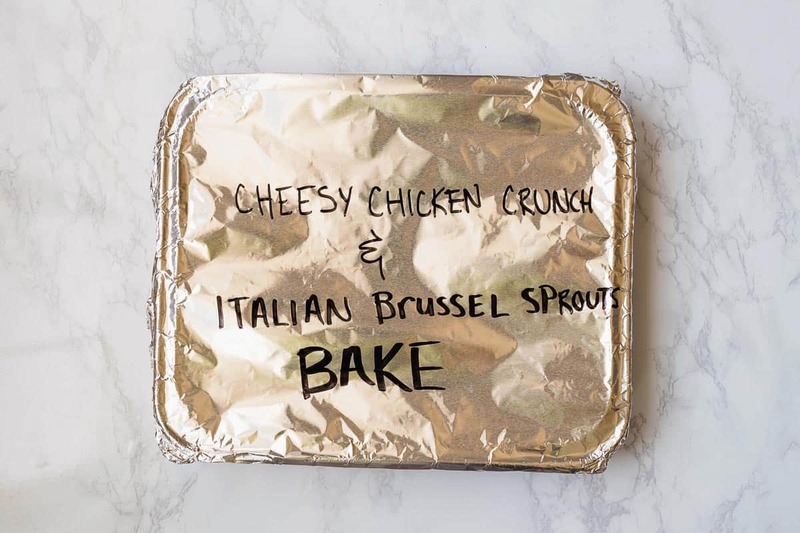 Cover the foil pan with plastic wrap and foil that has been labeled with the name and simple cooking instructions. Freeze. Thaw for 24 hours in fridge prior to cooking. Preheat oven to 350°F (180°C). Remove foil and plastic wrap. Bake for 40 minutes, uncovered, or until chicken is cooked through and no longer pink. Serve hot.